I’m going to take you on a little journey. It’s okay. It might be a bit scary, but it has a happy ending. This is the story of a 5-year room transformation. All kidding aside, the real point I want to make is that rooms evolve over time, and that it’s okay to take your time doing a room. After building the farmhouse, we just didn’t have the funds to fix it up perfectly at the time. We had to pay for stuff like a road, water well, and a septic tank. Pretty bedding wasn’t in the budget. I have been working on this room as I have time and money for 5 years. In June 2009, the house was finally ready for us to move some things in our little farmhouse. The girls and I and our friend Diana went out to the farmhouse after it was finished to unpack and set up the house. We had to unpack everything and put the beds together. The beds were a priority, since that was where we were sleeping that night. I had 3 new mattresses, 3 bed frames, some old sheets, and lots of quilts. This is what it looked like that first week. Not fancy, but it was a place to sleep. 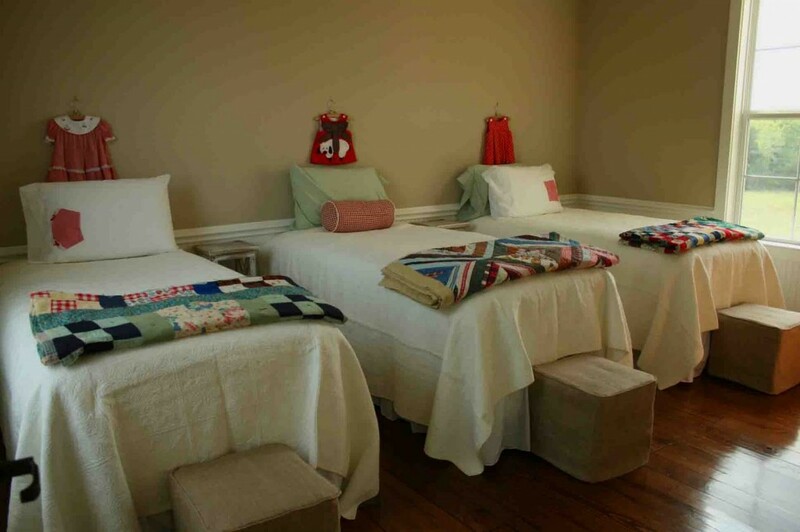 Then I found some matching quilts for the beds, and the little ottomans. I was so excited; I could see it was coming together. I even made little burlap slipcovers for each ottoman. Next I happened onto the little frames form the dresses. 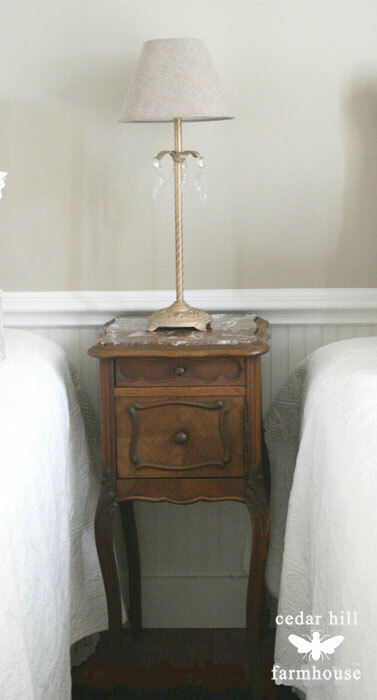 I also added the French nightstands,the baskets at the foot of the bed, and some lamps, woo hoo!! The lamp shades were too small I knew that, but I would deal with that later. 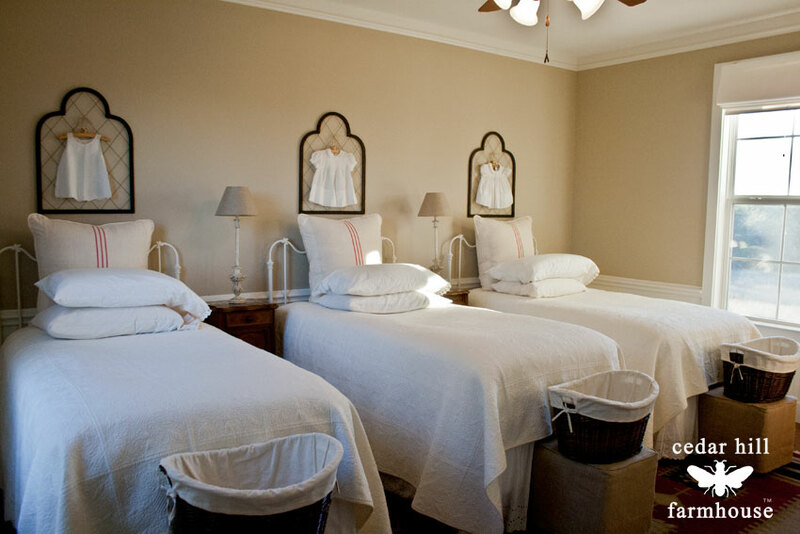 The next thing I did was to go with white dresses on the wall, and to remove some of the red pillows. Then came the day when we finally had new iron headboards. It was a very exciting day for me. Later, I changed out the lamps so that the shades were sized better for the space. Then the lamps were changed back to the original ones with the crystals, but with the bigger lampshades. And now for a reversal of sorts, I am adding some red back into the room. But this was too much. So I folded the duvets down at the base of the bed. Then I folded them a bit more. Then I tried using these soft throws at the foot of the beds. 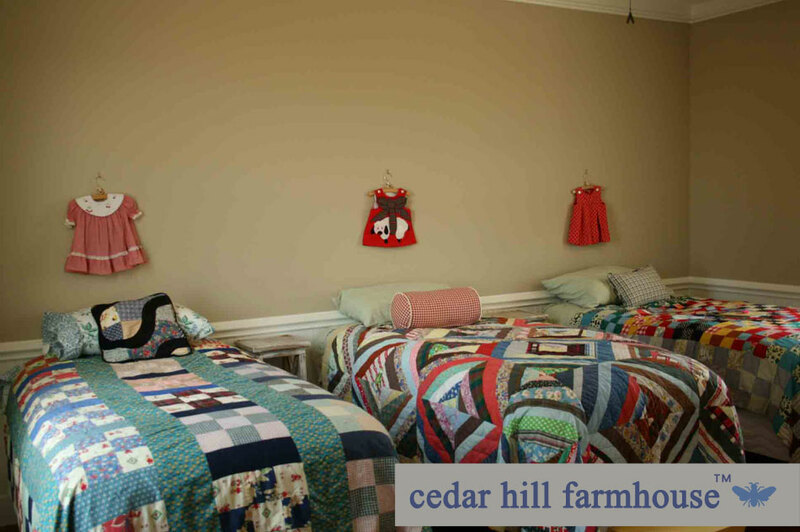 The throws in the photo below were provided by Turkish T.
So there you have it, time lapse photography over 5 years of the girls bedroom at the farm. Sometimes it takes awhile to get a room the way you want it. That’s okay. Just a note: The room does not look this nice when my girls are here. I decided you would prefer to see it all cleaned up with the beds made. Oh, what a lovely transformation! I know all about transformations and how long they can continue! I’m always tweaking things in my entire house…until it’s just right. Love your transformation! True Jan, I think I am always tweaking, and never actually done. I am glad I am not the only one that takes a while to get it the way I want it! That’s why I shared this. To show you are not the only one! It was very encouraging to see this post! I enjoyed the process and the improvement over time! I LOVED all the pictures! Thanks for all you do! 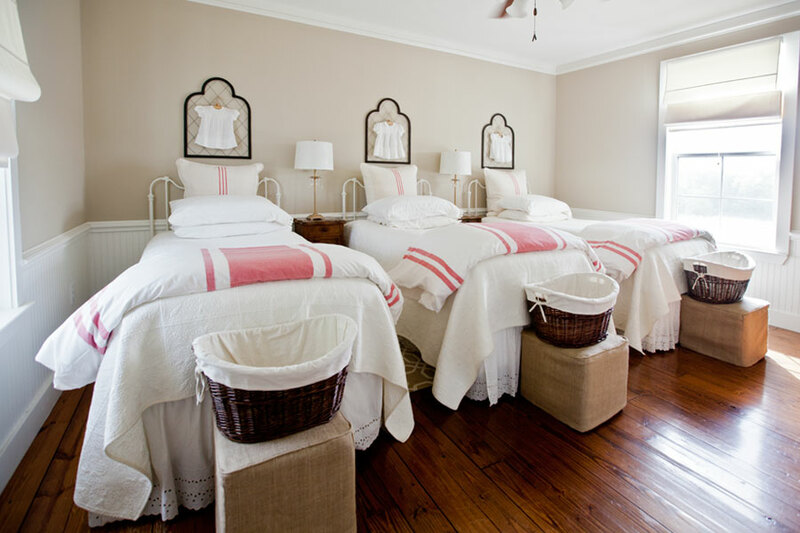 I love seeing how this room changed over the years… And to be honest, I like them all! 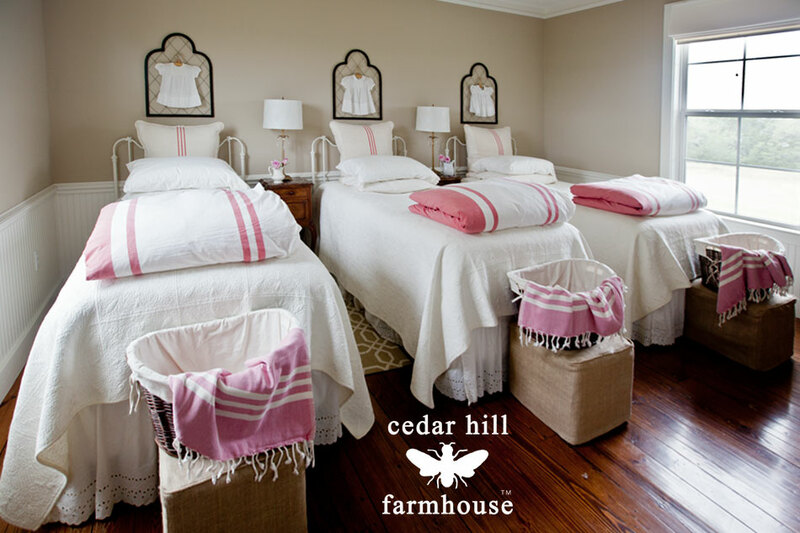 A great idea to show the changes, once you started to add the accessories, baskets and the pinky red accent it made such a difference and gave life to the room. I seem to be constantly changing and evolving every room in my house. My master bedroom is now finished, well to the point I hope to reveal it next week. Great transformation! You’re good at details. The room looks really gorgeous now! 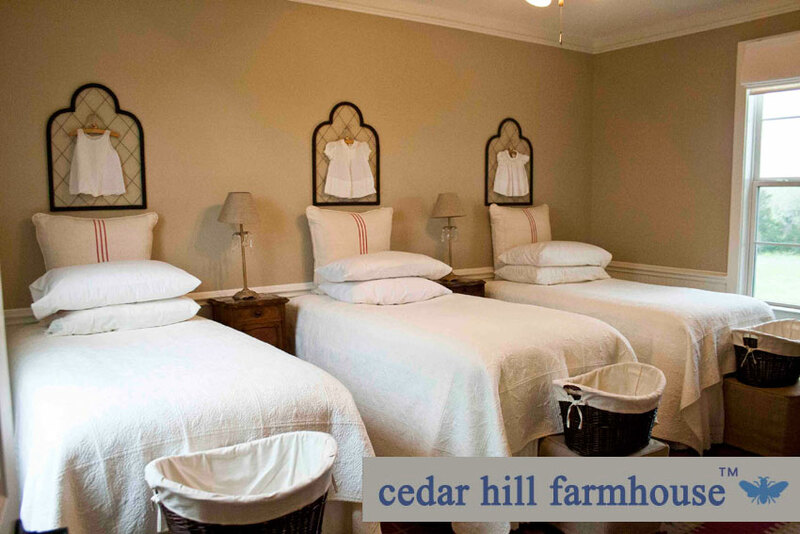 This is such a sweet, “farmhouse” room for your girls, Anita! Some things are always evolving…that’s a sign of true creativity! I love the look you now have and I’m wondering where you found the pillows and comforters with the red grain sack stripes. Love them!! Jane, the grain sack pillows I made from vintage grain sacks. The duvets are from Ikea. I love the evolution of this room! It looks beautiful and I love the touches of color! You know the dark sweet french inlaid dark wood marble top “humidor cabinet” or it appears to look like one, the side table between the beds, well I picked on up a year ago, and as sad shape it was in I cut it up creating a special piece from it, I also added salvage to the piece, it’s posted right now as part of a French tour linking with blogger friends to our productions. I think it’s a piece you would appreciate know you have a similar styled piece. Love all your transformations for different reasons. 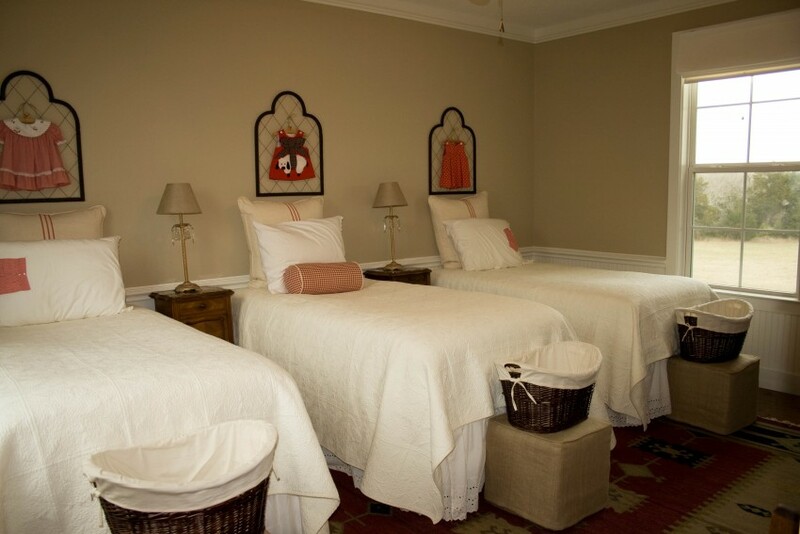 Every time I see you post of this sweet room I feel like I am going to hear the story of “Goldie locks and the three bears.” It’s truly a story book room, mostly because of the 3 single beds. 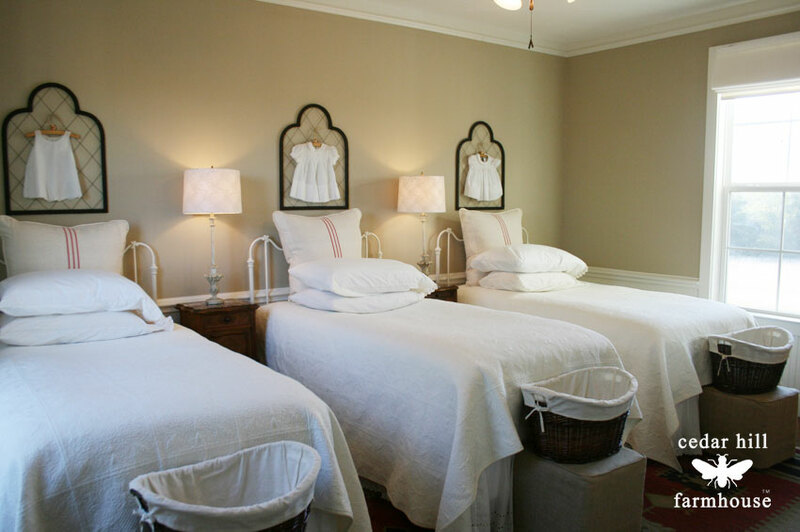 My favorite style was the all white with the white iron headboards, and the very last photo with the Turkish throws. With more of your beauty to admire. Dore thanks and I will go check out your French tour!! 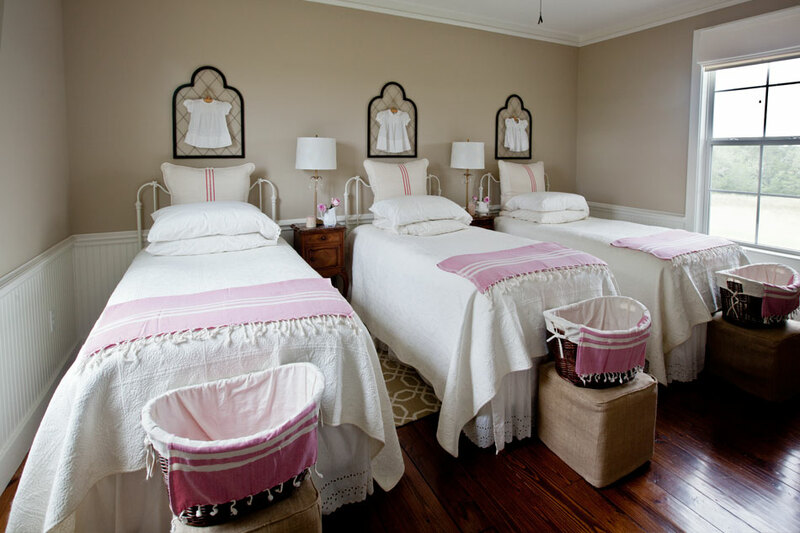 I love every time you show that sweet room! Such fun to see it transform over the years! 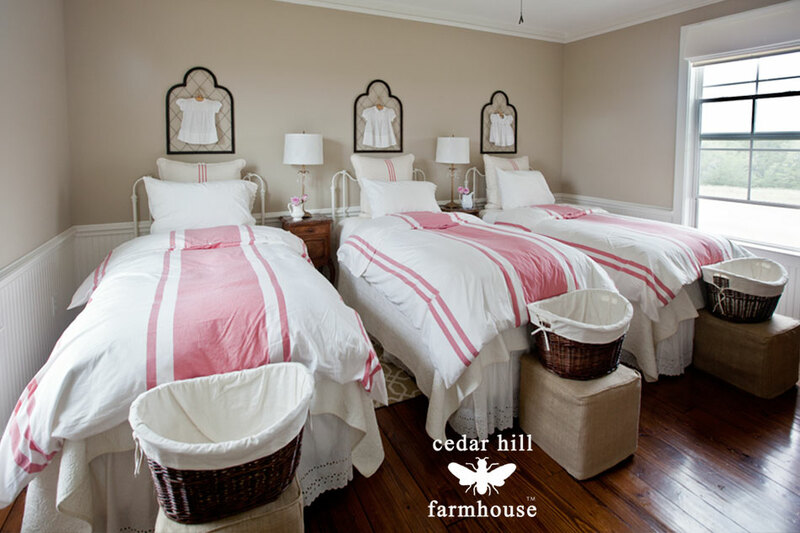 Oh, dear friend, I love the transformation of this bedroom!!! I am in a similar situation now. I LOVE my Master Bedroom bedding, but age is showing terribly on it. but wonder if we’ll be making a move in the future and if I’ll wait until then. Pat, that’s a tough one. I changed a lot of things before we moved, but had the move in mind. The transformation has been grand…love the end result. Really like the red touches. It was a wise choice to put them back in. I love the sweet room from beginning to end! Just lovely………………….Thanks for sharing it. What a lovely room! I would think anyone would be honored to be able to sleep in there. The little pops of color are just perfect. I too have been working on a room for several years and there are just a few things I just can t seem to get right. You do give me hope that it will come together at some point. Can you tell what the wall color is on the upper half of walls? Love the color! Thank you!!! Who is it by? Oops, it is Sherwin Williams. Sorry Candy!! I see it, Sherwin Williams. thank you again!!! Have a wonderful day! This evolution is delightful! The end is my favorite too. I have twin daughters and a dear friend handmade heirloom baby dresses for them. I would love to copy placing them over the beds. (Years ago I thought of putting them in a shadow box) Your idea is so much fresher!! Where did you get the lovely “frames” they are hanging on? They were ordered from Creative Coop. But they only sell wholesale. Love the white with just a touch of color. I love the mini dresses hanging on the wall. The bedroom is lovely. Great job. Thank you for sharing this post. The room looks wonderful. Anita, enjoyed seeing the transformation of the girls’ room over the years! Love seeing how you decorate! Simply lovely! Oh the beginning of things with such promise! Love the finishing end….for now! I love them all but I prefer the ones with the duvets. I am about to make a duvet cover for a queen bed in my spare room and am having a problem with what size duvet, I think that’s what they’re called, to buy for inside the cover. I like the way you could fold yours down to the bottom of the bed. I don’t want to buy a away oversized one. Could you recommend a size? I have one bookmarked that is rather puffy, but I don’t want a flattish one either. I think it goes by down amount. Not very clear on all of this and hope I’m explaining it right. Get as fluffy as you can get or use two duvets.